Swiss precision. More than 200 tiny parts. A sapphire crystal. A price tag that’s close to twice what I paid for my first car. It sounds like something from Rolex or Omega. But it’s the Aura, a new cell phone from Motorola. Aura is available exclusively from Motorola. It costs $1995 and will start shipping in December; there’s a “Buy Now” button on the Aura site, but nothing happened when I clicked it. This watc–er, I mean phone is clearly a big deal for Moto, one that the company must have been working on for a long time. 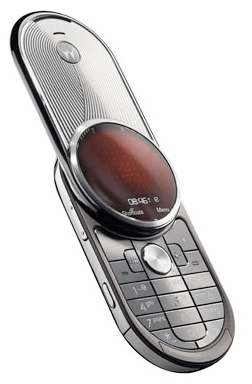 The timing of its release turned out to be unfortunate; a phone that costs two grand would have sounded excessive no matter what, but now it sounds weirdly out of touch with the world we find ourselves in as of mid-October 2008. And I think the idea of bragging about the number of parts inside a electronics device is tone-deaf on some fundamental level. Even the cheapest electronic gizmo, of course, is crammed full of far more, far tinier components than Motorola’s phone, in the form of transistors. But the whole point of digital technology is that you don’t need to worry about complexity. Or, for that matter, to pay for it. It’s just there, silently making your life a little better. Also: If you’re contemplating splurging on a good mechanical watch, you can tell yourself you’ll hand it down to generations yet unborn, and it’ll become a treasured heirloom. (And it might: I also own and proudly wear a watch that my grandfather bought more than sixty years ago.) You’re not going to hand down the Aura to anyone. In fact, you’ll probably be fortunate if the cell networks in place a decade from now support it. But maybe you’d like to convince me that this phone makes sense? My first thought was, that’s a lot of parts and something’s going to break soon. A problem to fix. And T-Mobile owes me a new free phone soon. One of the perks of being rich is you can afford decent items with a massive price tag, and that sets you apart from the rest of the commoners. Timex works as well as a Rolex in giving me a pretty good idea of the current time. Honda works as well as a Porsche which works as well as a Lamborghini. Each of them will get me up to legal highway speeds and onto my destination. Free or discounted cell phones are for the middle class. I could bling out a Razr, but who can really tell if it’s really diamond encrusted or Bedazzled? Own and/or bling out an Aura, and you know you aren’t starting with a phone that can end up in the hands of the people who work for you. And on a semi-unrelated note, I don’t get why they sell jewel-encrusted items like iPods and USB drives, given that they look positively ancient when the next model or two rolls around. I think I’m going to buy those $800.00 jewel encrusted 14k toenail clippers first. Externally blinging out anything is so 2004. Blinged out phones these days to the aficionados are really whatcha got under the hood, as in the cool apps.